The huge promotion and hype behind the 86, makes room for promoting anything as the side dish and the typical side dish is the show sport of drifting. Though Subaru, kept it a bit more subtle and mature with the BRZ and of course could not runaway from their rallying heritage. The “Zero” BRZ, is obviously, a Zero Car or a starter car to open the race course for the competition cars. I would say it is a nice way to market the model without making whistles and explosions of the whole ‘boom! drifting gets you laid!’ hype. The BRZ/86’s chassis is a solid one, well balanced like a mid-engine car and suitable for several motorsport applications, whether is it drifting, endurance racing or rallying. Thumbs up for this subtle and neat marketing effort from Subie. This is how we like to view our sport car as fans. One a side note, related to the first paragraph of this post, hopefully some more interest in rallying grows back again, if it is to be served as a side dish with all the 86 & BRZ hype. 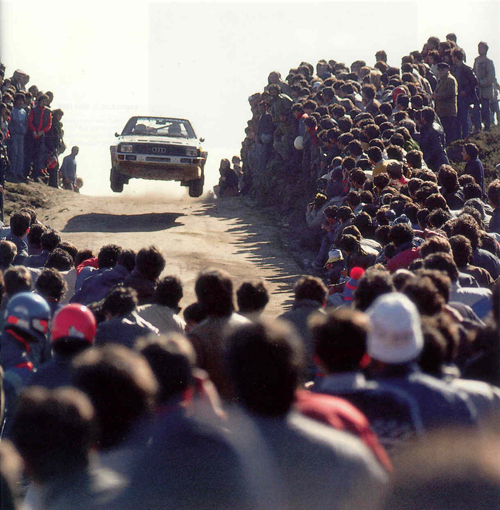 Pictured above, is the legendary group B Audi Quattro in mid air, with dozens of fans swarming around to see it, try to touch it or simply inhale a deep breath of the sanctified ‘Quattro’ dust cloud. This was a purely raw experience we truly miss in our modern times. Comparing this above shot with our times, today’s generation of car enthusiasts is a lost one; conditioned mostly by second hand experiences of Hollywood’s Fast n’ Furious glamour and endless hours on video game driving simulators. The big question is as current day car enthusiasts, are we in the mindset to look beyond all the virtual conditioning that was placed upon us? Can we manage to ever revive a spartan era of the automotive world? A time when some Porsche models were sold with tool kits in the trunk. We passed through a decade of automotive boredom; driving was no longer the key essence of an automobile. We got bombarded by technology like Front Wheel Drive, Smart Gearboxes, Green Energy, Soft Roaders and plenty of electronic aids, enough for a 10 year old to manage piloting a 400 horsepower behemoth which is a fine thing up until they started, excessively; seeping into our beloved sport car segment; resulting in the boom of luxury performance vehicles. One cannot fight such a huge invasion. Plus, it would be foolish not to admit that is was out of a necessity. Where there was a demand, car-makers did what it takes to meet those demands, in order to survive. We lived with it as long as nobody forgot about the missing link of ‘pure unmolested driving’. You realize at times, as a car enthusiast, that many of us did drive the wrong cars, grew up with the wrong automotive role models and eventually valued less driver related affairs in automobiles. Our times feature what is more of a ‘’motortainment’’, which manages to attract the new generation of enthusiasts that merely look at the simplistic aspect of things. It was never their fault; they just need to see the light, at least, before it’s too late. Turning back the hands of time, we date back to the 80’s up to early 90’s; when Formula one & rallying were religiously followed by many. An era we, current day car freaks, never clearly understood. It was a time, car makers willfully dragged themselves into motorsport and competition which influenced how they made the cars and marketed them. A technological revolution accompanied that era; pushing turbos & all wheel drive, to name a few, into our mainstream production cars. It was a time when glamour, fantasy, politics and safety standards did not heavily molest the minds of enthusiasts or the sport itself. Up until today, the elders speak proudly of all the action, to the extent it makes one feel like we missed an epic historical rock concert. You see all the classic footage out there and realize how much passion and heart the crowds once had. This was pure, unmolested motorsport. The first Lexus IS might have paved the way for the current successful generation of IS. Though I find this one more charming and the reason for that is because it serves as a nice platform for modifications especially the visual ones. 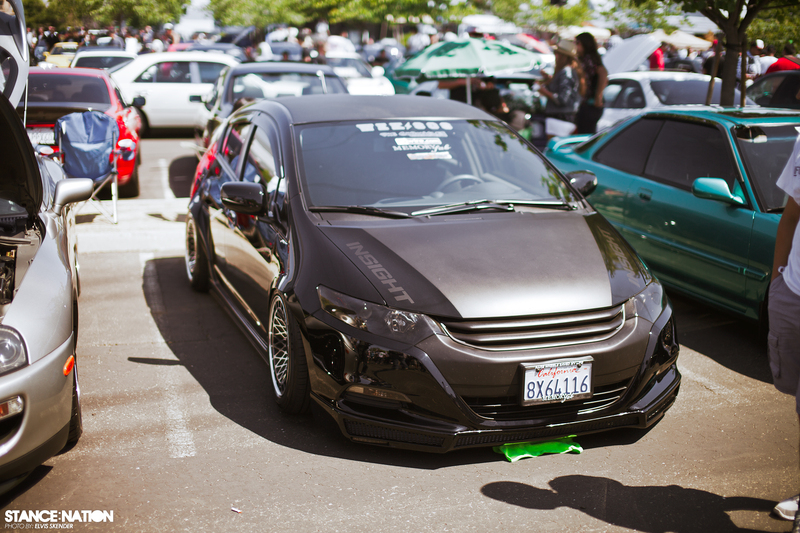 I never was a fan of stance but it is undeniably part of life now and might as well enjoy it. 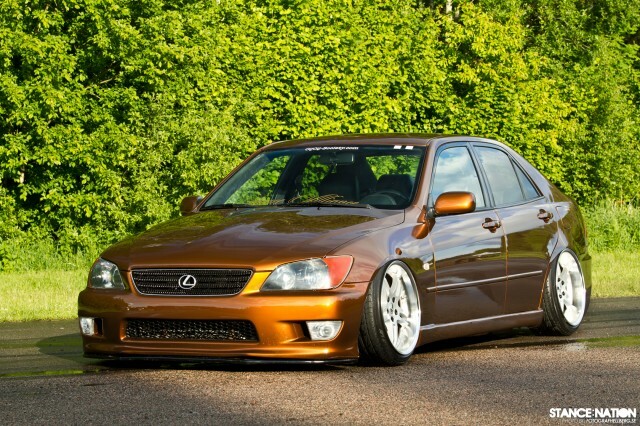 This is another Toyota saloon dropped and flushed; finished with a nice metallic Audi Brown. Enjoy the pictures & I hope you had a good weekend. Sometimes the most beautiful creations in this world actually look ugly, that truly emphasize the term: beauty is skin deep or whatever those lotion & creme ads always mention. As far as we understood from all the hype concerning this Turbo Kit, for the BRZ, is merely a corner stone for bigger plans in the future. 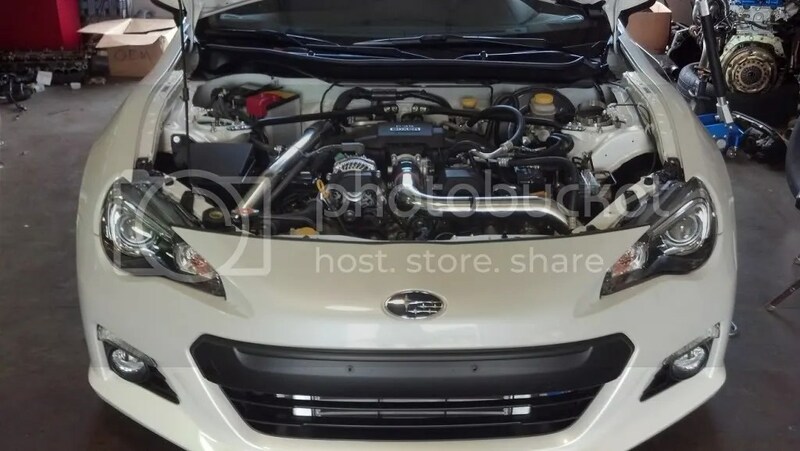 Ohio based tuning garage, Accelerated Performance, recently over-dosed the communities with updates and details about this setup. 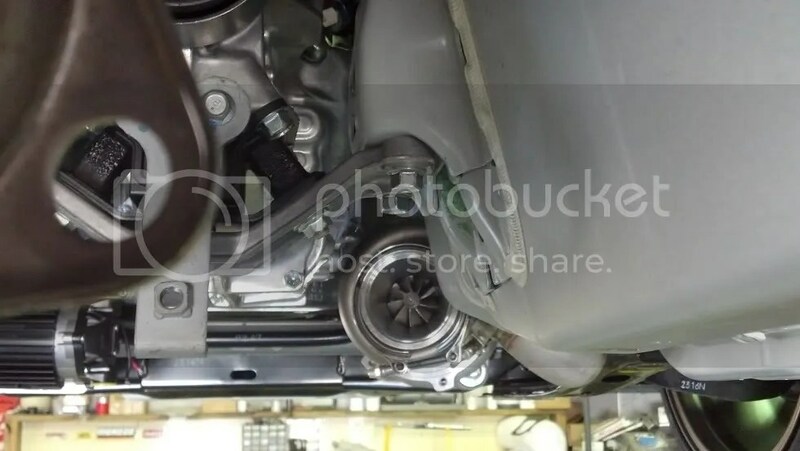 This is a low 4psi boost setup (running on stock compression ratio of 12.5:1) form the first place as no engine internals were touched during the process and even the OEM headers with the cat converter remain in place. Still, it is confirmed that more power can be squeezed and optional stronger pistons & billet crank rods are available as required. The main adjustments were mostly in fuel & air ratio for this setup. About four years ago, we found out about the FT-86 concept and we fell in love with it. Why you would ask me? Well, because for the first time a car maker actually builds a formula that fits the exact criteria for car enthusiasts; a small, light weight and affordable rear wheel drive car, nothing more or less. My mind didn’t go any further. It was a time when the only affordable rear wheel drive sports car out there was a Mazda MX5 and the market was desperately starving when it comes to such segment of sports cars. The 86 did gain massive hype from the media and fans alike. Some of the reasons are the fact that it refreshes the image of Toyota after a long absence from the segment. Prior releasing early concepts for the 86, fans were scared that Toyota might ditch its racing heritage in favor of sales figures like other car-makers are doing in our times. Yet Akio Toyoda, president and CEO of Toyota Motor Corporation, arrives on time to save the day and rids the Mazda Mx-5 from its loneliness. Besides the fact that the 86 was a spiritual successor of the original Toyota AE86, which already has a huge cult following among enthusiasts especially in Japan & Australia. Suddenly the hype starts bloating and a huge fog of cheesy marketing, PR approaches blows the whole image of this modern day 86 or ‘hachi-roku’ out of proportion. Yes too much publicity is better than none but matters did slightly backfire.